Palestinians take part in a rally marking the 25th anniversary of the founding of Hamas, in Gaza City on December 8, 2012. September 4, 2014 -- Antipodean Atheist, posted at Links International Journal of Socialist Renewal with the author's permission -- The Islamic Resistance Movement – Hamas is the abbreviation from the Arabic – has constituted the democratically elected government of the Palestinian territories since January 2006. It swept to power in that year, winning a majority of seats in the Palestinian parliament, amid recognition of the failure of the traditional secular nationalist Palestinian parties, in particular the Fatah party that had dominated the Palestinian leadership for decades. Young opponents of Israel's war of terror protest, in Sydney, August 2, 2014. Photo by Susan Price. August 2, 2014 -- Green Left Weekly -- “This is not a war. It is genocide”, reads a popular slogan on homemade signs at protests against Israel’s current attack on the Gaza Strip. Israeli ground operations that started on July 17 increased the casualty rate for both Palestinians and Israelis. By August 1, 1592 Palestinians and 66 Israelis had been killed, the New York Times said. That is 24 Palestinians killed for every Israeli. Dramatically larger than the disparity between the two sides in overall numbers killed is the disparity in the number of civilians killed. On the Israeli side, only three of the fatalities were civilians — 95% of Israelis killed by Palestinians were combatants. Israeli human rights organisation B’Tselem published figures on July 31 that showed that between July 8 and July 30 less than 14% of the Palestinians killed by Israelis were combatants. Three Palestinian combatants have been killed for every Israeli combatant while 473 Palestinian civilians have been killed for every Israeli civilian. June 3, 2013 -- The Bullet -- This year marks the twentieth anniversary of the signing of the Oslo Accords between the Palestine Liberation Organization (PLO) and the Israel government. Officially known as the Declaration of Principles on Interim Self-Government Arrangements, the Oslo Accords were firmly ensconced in the framework of the two-state solution, heralding “an end to decades of confrontation and conflict”, the recognition of “mutual legitimate and political rights” and the aim of achieving “peaceful coexistence and mutual dignity and security and … a just, lasting and comprehensive peace settlement”. November 16, 2012 -- Russia Today -- Tariq Ali analyses Israel's latest attacks on the Palestinian people in Gaza. For more coverage of Israel's assault on Gaza, click HERE. November 14, 2012 -- Al Jazeera's Shakuntala Santhrian interviews Ali Abunimah, co-founder of Electronic Intifada. More from Ali Abunimah below the interview with Shamikh Badra. November 15, 2012 -- Green Left Weekly -- Israel has launched a fresh full-scale war on the besieged people of Gaza. As well as assassinating a Hamas spokesperson (and publicly threatening all Hamas representatives), more than 10 people had been killed by November 15. The dead reportedly includes Omar, an 11-month-old baby whose father works for BBC Arabic. Shamikh Badra, youth leader of the Palestine People's Party, speaking at a forum in Perth during his Australian tour. Badra is touring Australia thanks to socialist youth group Resistance. Filmed by Zeb Parkes for Green Left TV. August 12, 2012 -- Green Left Weekly -- Shamikh Badra is the youth and students coordinator for the Palestinian People Party (PPP) in the Palestinian Gaza Strip. The PPP is a left-wing, secular party that is part of the Palestinian liberation movement. Badra is on a tour of Australia sponsored by the socialist youth organisation Resistance and the Socialist Alliance. Since the Egyptian revolution that overthrew Mubarak, there has been a lot of hope for changes in Egypt's policy towards Israel — in particular the possibility that the Egyptian government might open its borders with Gaza and alleviate Israel's near-total siege on the territory. How has the relationship between Gaza and Egypt changed? Now the borders between Gaza and Egypt are closed completely. The situation, which was so bad before, is even more difficult and complex. 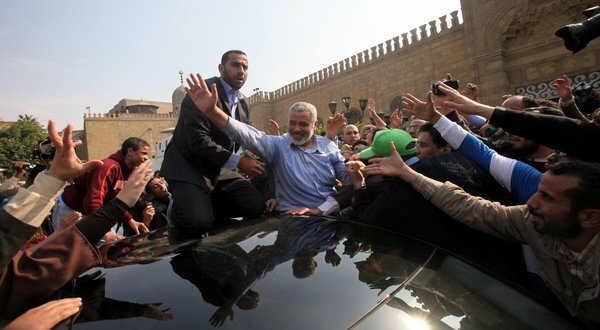 Hamas’s prime minister in Gaza, Ismail Haniya, greets supporters after Friday Prayer, where he spoke out against President Bashar al-Assad. March 7, 2012 – Links International Journal of Socialist Renewal -- The declaration by Ismail Haniyeh, prime minister of Hamas, that his movement was backing the popular uprising in Syria against the brutal regime of Bashar al-Assad was widely reported, as was the significance of his statement to worshipers at Cairo's Al Azhar mosque. Hamas, while ruling the Gaza Strip, had its exile leadership based in Syria; now Haniyeh was perhaps betting on a new strategic relationship with post-Mubarak Egypt. Haniyeh saluted “the heroic Syrian people, who are striving for freedom, democracy and reform”. Egyptians call for Mubarak's ouster, Tahrir (Liberation) Square, Cairo, January 29, 2011. Photo by Matthew Cassel. January 29, 2011 -- Electronic Intifada -- We are in the middle of a political earthquake in the Arab world and the ground has still not stopped shaking. To make predictions when events are so fluid is risky, but there is no doubt that the uprising in Egypt -- however it ends -- will have a dramatic impact across the region and within Palestine. Mahmoud Abbas with US President George W. Bush and Israel's Prime Minister Ariel Sharon at the Red Sea Summit in Aqaba, Jordan, on June 4, 2003. January 28, 2009 -- If Western politicians and media are to be believed, the Palestinian Islamic Resistance Movement (Hamas) is an anti-Semitic, religious fundamentalist, terrorist outfit that forms part of an al Qaeda- (or, alternatively, Iranian-) led movement which seeks to violently impose Islamic law on the world, and is dedicated to the annihilation of Jews. However, what is Hamas’s actual practice and the source of its strong popularity among Palestinians? Hamas won the 2006 Palestinian Legislative Council (PLC) elections, which international observers described as the most democratic in the Arab world. In government, it has attempted to eradicate corruption and gangsterism. The demonisation of a democratically elected political leadership has become the justification for war crimes. The entire infrastructure of Gaza — hospitals, mosques, government offices, schools, water and energy, food stores, emergency services, orphanages — can be defined as “Hamas infrastructure” because Hamas remains the civil authority. “Hamas infrastructure” is equated with “terrorist infrastructure”, providing Israel and its Western backers with justification for deliberately targeting such civilian institutions, in flagrant violation of international law. In a speech from Damascus on January 11, 2009, Khalid Mish'al, head of the Hamas political bureau, spoke on Israel's 15-day assault on the Gaza Strip. This edited text of the televised address appeared on the Socialist Unity website. For earlier statements from Hamas, see http://links.org.au/node/842. The Zionists wanted to impose a humiliating defeat on us because the only obstacle to confront them is resistance, especially in the Gaza Strip. Perhaps the Zionists, because of the difference between the resistance in Lebanon and Gaza, thought that in comparison with Hezbollah, we were weak and they could regain the reputation of their army following its defeat in Lebanon. 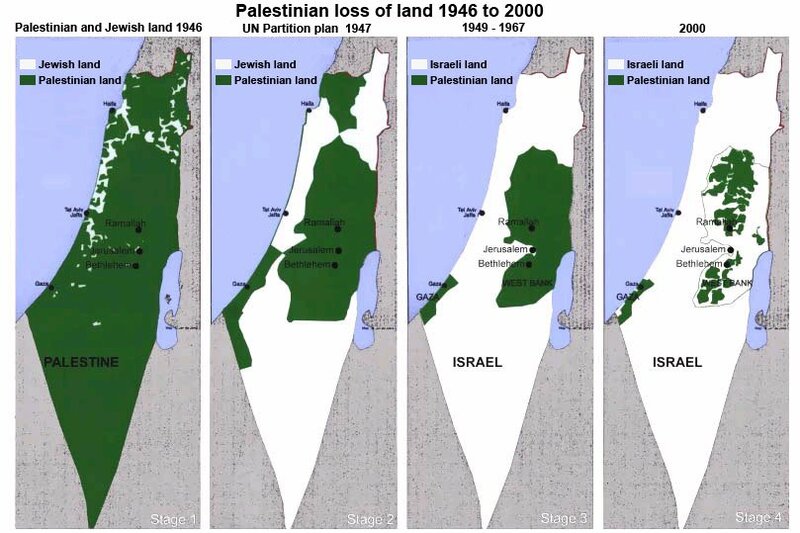 They tried to use the territories of Gaza to show their military might. So this is a battle of demonstrating military strength, a fight or war to impose a defeat on our people. The Zionists thought that we were the weakest. However, the Zionists were surprised by the resistance. January 6, 2009 -- Damascus -- While Americans may believe that the current violence in Gaza began December 27, in fact Palestinians have been dying from bombardments for many weeks. On November 4, when the Israeli-Palestinian truce was still in effect but global attention was turned to the US elections, Israel launched a "preemptive" airstrike on Gaza, alleging intelligence about an imminent operation to capture Israeli soldiers; more assaults took place throughout the month. The truce thus shattered, any incentive by Palestinian leaders to enforce the moratorium on rocket fire was gone. Any extension of the agreement or improvement of its implementation at that point would have required Israel to engage Hamas, to agree to additional trust-building measures and negotiation with our movement -- a political impossibility for Israel, with its own elections only weeks away. Not that the truce had been easy on Palestinians. In the six-month period preceding this week's bombardment, one Israeli was killed, while dozens of Palestinians lost their lives to Israeli military and police actions, and numerous others died for want of medical care.